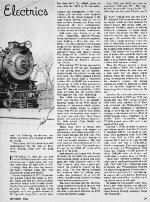 Description: Here is page two of a two-page article entitled "Busiest Railroad." 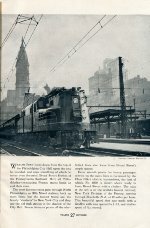 It was published originally in the October 1941 issue of "Trains" magazine, page 27. Shown here is a photo of Pennsylvania Railroad engine #4800, a GG-1 built by General Electric in August of 1934 and currently on display at the Railroad Museum of Pennsylvania. "Even, smooth power for heavy passenger service on the main lines is furnished by the Class GG-1 electric locomotives, the first of which, No. 4800, is shown [here] ready to leave Broad Street with a clocker." Description: Here is page one of a four-page camera study entitled "Keystone Vignettes." 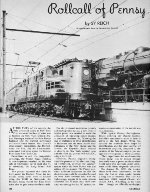 It was published originally in the April 1946 issue of "Trains" magazine, page 10. No author is specified. Pictured in the center is K-4S #5495. 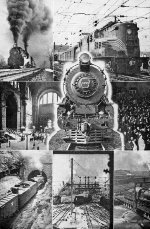 Pictured Clockwise From Top Left: K-4S #5442 heads a passenger train near Freeland, Maryland, in this photo by William Moedinger Jr.; GG-1 #4800 pulls a passenger train at an unidentified station; wartime crowds surge at New York's Penn Station; E-6S #198 rides the turntable in West Philadelphia, Pennsylvania, in this photo by Harold M. Lambert; towerman's view from inside "K" Interlocking in Washington, DC; an M-1A enters the New Portage Tunnel in Gallitzin, Pennsylvania, with an eastbound freight in this photo by H.W. Pontin; and an interior view of New York's Penn Station. Description: Chione. Here is a duplicate 35mm color slide via Al Chione. Shown here (L to R) are Pennsylvania Railroad engines #4800 and #4887. Both are GG-1 (2-C-C-2) electric locomotives rated at 4,620 horsepower each. #4800 was built by General Electric as number "4899" during August of 1934, renumbered "4800" in November of 1934, and presently on display at the Railroad Museum of Pennsylvania in Strasburg. In this photo, it looks to me like "Old Rivets" is deadlined. Do you see what's missing? #4887 was built in Juniata during April of 1939. The photographer's name, the date, and the location are not recorded. Description: Here is page one of a six-page article by Sy Reich entitled "Rollcall of Pennsy Electrics." It was published originally in the October 1962 issue of "Railroad" magazine, page 28. Shown here are Pennsylvania Railroad engines #4800 and #5426. #4800 is a GG-1 built by General Electric during 1934; it is presently on exhibit at the Railroad Museum of Pennsylvania in Strasburg, Pennsylvania. #5426 is a K-4S "Pacific" (4-6-2) built by the Baldwin Locomotive Works during 1927 and retired in August of 1956. They are posed at ZOO Tower in Philadelphia, Pennsylvania. Description: Here is page two of a six-page article by Sy Reich entitled "Rollcall of Pennsy Electrics." It was published originally in the October 1962 issue of "Railroad" magazine, page 29. Shown here are Pennsylvania Railroad engines #4800 and #5426. 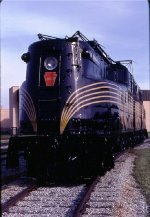 #4800 is a GG-1 built by General Electric during 1934; it is presently on exhibit at the Railroad Museum of Pennsylvania in Strasburg, Pennsylvania. #5426 is a K-4S "Pacific" (4-6-2) built by the Baldwin Locomotive Works during 1927 and retired in August of 1956. They are posed at ZOO Tower in Philadelphia, Pennsylvania. 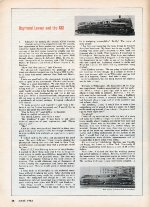 Description: Here is page five of a 17-page cover article by Frederick Westing entitled "GG1: Story of the Most Famous Electric Locomotives in the Western Hemisphere." It was published originally in the March 1964 issue of "Trains" magazine, page 24. Photo Caption: "Minus pantographs and paint, archetypal GG-1 of 1934 ~ originally numbered 4899, later 4800 ~ stands outside Baldwin's Eddystone (Pa.) erecting shop." Shown here is Pennsylvania Railroad engine #4899, a GG-1 built by the Baldwin Locomotive Works during August of 1934. It was renumbered "4800" in November of 1934 and is currently on display at the Railroad Museum of Pennsylvania in Strasburg. 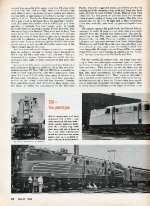 Description: Here is page six of a 17-page cover article by Frederick Westing entitled "GG1: Story of the Most Famous Electric Locomotives in the Western Hemisphere." It was published originally in the March 1964 issue of "Trains" magazine, page 25. Photo Caption: "Minus pantographs and paint, archetypal GG-1 of 1934 ~ originally numbered 4899, later 4800 ~ stands outside Baldwin's Eddystone (Pa.) erecting shop." Shown here is Pennsylvania Railroad engine #4899, a GG-1 built by the Baldwin Locomotive Works during August of 1934. It was renumbered "4800" in November of 1934 and is currently on display at the Railroad Museum of Pennsylvania in Strasburg. 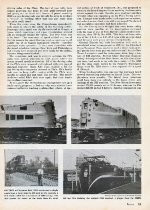 Description: Here is page seven of a 17-page cover article by Frederick Westing entitled "GG1: Story of the Most Famous Electric Locomotives in the Western Hemisphere." It was published originally in the March 1964 issue of "Trains" magazine, page 26. Top Photo: Shown here is PRR engine #4899, a GG-1 built by the Baldwin Locomotive Works during August of 1934. It was renumbered "4800" in November of 1934 and is currently on display at the Railroad Museum of Pennsylvania in Strasburg. Bottom Photo: Shown here is PRR engine #4814, a GG-1 built by the Baldwin Locomotive Works during August of 1935 and retired in May of 1967. Description: Electric Action. Here is a duplicate 35mm color slide by an unidentified photographer. Shown here (R to L) are Pennsylvania Railroad engines #4800 and #4935. Both are GG-1 (2-C-C-2) electric locomotives rated at 4,620 horsepower each; both have been preserved and are presently on display at the Railroad Museum of Pennsylvania in Strasburg. #4800 was built by General Electric as number "4899" during August of 1934 and renumbered "4800" in November of 1934. It's idling with both pantographs up . . . and silently prays: "Wash me!" #4935 was built in Juniata during March of 1943. The date and the location are approximations. Description: Electric Action. Here is a duplicate 35mm color slide by an unidentified photographer that was taken in Kearny, New Jersey, on 4 September 1967. Shown here is Pennsylvania Railroad engine #4800, a GG-1 (2-C-C-2) built by General Electric as number "4899" during August of 1934, rated at 4,620 horsepower, renumbered "4800" in November of 1934, and presently on display at the Railroad Museum of Pennsylvania in Strasburg. Description: Better known as "Old Rivets", this was the first GG1 constructed with rivets rather than welded body for later ones after winning a race over the other prototype, R1. Originally it was numbered 4899 but later numbered 4800 to start the series of GG1's. It served PRR, then PC and finally Conrail. It is the only GG1 to wear the PRR, PC, Conrail Bicentennial and Conrail blue color schemes. 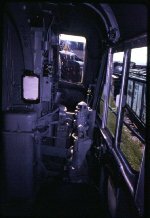 It was sold to the National Railway Historical Society in 1980 and restored to its 1935 cosmetic appearance by the Railroad Museum of Pennsylvania for display beginning on November 20, 1982. Description: Here is page 25 of a 96-page monograph entitled "Power To Burn: Smoke, Steam, & Cinders" that was edited by James M. Shafer and published during 1976. Partial Caption: "PRR No. 4800, first GG-1, newly painted, is shown in Philadelphia" at the Broad Street Station. #4800 is a GG-1 (2-C-C-2) built by General Electric as number "4899" during August of 1934, rated at 4,620 horsepower, renumbered "4800" in November of 1934, and presently on display at the Railroad Museum of Pennsylvania in Strasburg. Description: Here is page 37 of a 40-page booklet published by Harry P. Albrecht entitled "A Picture Study Of The K-4." First issued in October 1967, revised in September 1976. Partial Caption: "This rare newspaper picure shows the first GG-1 electric locomotive No. 4800 beside K-4 No. 5426 near the Zoo Tower in Philadelphia, Pa." Pennsylvania Railroad engine #4800 is a GG-1 (2-C-C-2) built by General Electric as number "4899" during August of 1934, rated at 4,620 horsepower, renumbered "4800" in November of 1934, and presently on display at the Railroad Museum of Pennsylvania in Strasburg. PRR engine #5426 is a K-4S (4-6-2) "Pacific" built by the Baldwin Locomotive Works during February of 1927 and retired in August of 1956 after 29 years of faithful service. Description: Perhaps it will someday again be cosmetically restored; it's in black primer currently, stored outdoors in poor condition. Description: The first GG1 built, named "Old Rivets" for its all riveted exterior shell. Description: Note "4800" painted on the gray, curving frame. Cab signals immediately to left of painted numerals. Description: Controller on left front, brakestands on the right. Description: Builders plate from the very first GG1. Description: The very first GG1 built in 1934. Its the only GG1 with a riveted body. It is awaiting restoration at the museum. Description: Nicknamed "Old Rivets," this was the first GG1 and the only unit in this class with a riveted body. Description: Amtrak E60 #603 (originally #964) in the company of PRR GG1 #4800 ("Old Rivets") at the Railroad Museum of Pennsylvania. Although the E60 was designed to replace the GG1, it didn't quite work out that way. Description: "Old Rivets", the very first GG1 (Built 1934), on display in the museum yard. Description: PRR 3937 (Built 1911) parked next to "Old Rivets" the first GG1 in the museum yard. Description: The last survivng DD1 and its successer, the GG1 stand side by side in the museum's yard. Description: The original PRR GG1 4800 commonly known as Ol' Rivets. This G was also the only one to wear Conrail blue and also carried a Bicentenial paint sceme in 1976. Description: Two equaly historic locomotives are seen at East Strasburg. SRC 90 is the only Decapod operating in the US today while PRR 4800 was the first GG1 ever built. Description: In black paint, could the "PC" worms be next?? ?